Okay, so I don't usually do movie reviews on my blog, even though I'm an avid movie-geek or a buff with about 150 GB of movies on my HDD to prove it, it's jut not my cuppa generally to review movies as I enjoy most movies from a very script point of view rather than the whole package / direction, screenplay, casting blah blah and blah. 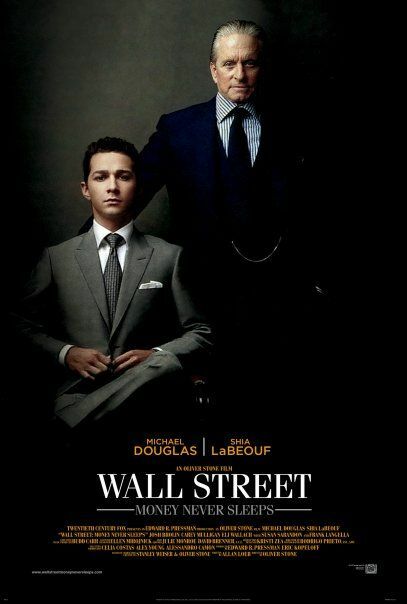 Anyways so I decided to write a review on this movie for a few reasons, mainly to do with the simple fact that I've been highly impressed by Oliver Stone's original version and the flamboyant character of Gordon Gekko. I mean come on who wouldn't be especially during the era when being a stock trader, smoking Cuban cigars, having a flashy Merc / Limo and wearing a suit to work was any young man's fancy. Ok, maybe I'm not as old as you guys think, but certainly Wall Street is part of my 150 GB collection and I loved it to the core. So yes, I do enjoy trading on the Dalal Street and I'm always thrilled by stock markets and related news, movies, books etc. So while we wait for Madhur Bhandarkar probably to make our own version of the Wall Street where we see a completely different Gordon Gekko, after being sentenced to 8 years of prison for insider trading. The movie starts with Gordon Gekko getting out in 2001 after finishing his sentence. Flash forward to 2009 where Gordon has published a book Is Greed Good? and is tired of the corporate life, he has become a preacher so to speak. Then the movie zooms to a young man's life, Jake Moore (played by Shia Lebouf) who is a hot shot trader working with one of the best investment firms in NYC. He is certainly the kind of a trader who thinks of Gordon Gekko as a role model while having a father figure in Louis Zable the head of his firm, played by Frank Langella. So the story moves on when his firm goes under and Louis Zable the father figure commits suicide. What Jake later realizes is that the firm went under because of rumors circulated by one of the rival firms headed by Bretton James (played by Josh Brolin). Now comes the interesting part, Jake Moore is in a serious relationship with a news reporter / blogger Winnie, Winnie 'Gekko' (played by Carrie Mulligan) yes, she is Gordon Gekko's daughter who hasn't spoken to her father and shares an estranged relationship with him. Jake, forms a pact albeit a secret one with Gordon to get him back with his daughter, in the process trying to reconcile and take revenge from Bretton who of course shares the same kind of rivalry with Gordon, a thing from his past... Well, I won't say much for the details will certainly be interesting enough for you to watch the movie and I wouldn't want to spoil your fun. Will Gekko really get back to his daughter and regain her trust? Will Jake be able to take revenge of the death of his father figure is something you gotta watch out for yourself. What I really enjoyed was how well the stock market terminology and jargons are properly used in the movie. The relationship between Jake and Winnie is very real and the scenes they share on the screen really hold strong. What I'm not really fascinated by and think made the difference for me between an okay / good movie and an excellent one was that it did not keep you on the edge of the seat. Especially with a few scenes for that matter from the Stock market. If you are a trader, you would want to have the excitement of the market portrayed on the screen to really bet on some money in the theatre for that matter. That was lacking. The ending could have been a little better for me although I'd say it was a good movie, it lacked the intensity and the depth of the original from 1987!